A conservatory is a building or room having glass or tarpaulin roofing and walls used as a greenhouse or a sunroom. If in a residence, it would typically be attached to the house on only one side. Conservatories originated in the 16th century when wealthy landowners sought to cultivate citrus fruits such as lemons and oranges that began to appear on their dinner tables brought by traders from warmer regions of the Mediterranean. Municipal conservatories became popular in the early 19th century. In the UK the legal definition of a conservatory is a building that has at least 50% of its side wall area glazed and at least 75% of its roof glazed with translucent materials, either polycarbonate sheeting or glass. Today, the terms sunroom, solarium and conservatory are used interchangeably by the public, but in general the term conservatory and particularly English conservatory evoke the image of an ornate structure, echoing the traditions of that Victorian era of conservatory building. Modern conservatories tend also to be graced with a traditional cresting and finial, along with single, double patio or even bi-folding doors. These beautiful structures have been designed and built around the world, in private gardens, parks, and botanical institutions. Smaller garden conservatories have become popular, which may be dual-function, equally devoted to horticulture and recreation, or favor the latter, as a solarium or sunroom. Preservation of citrus and other tender plants started out as crudely as building a pergola over potted plants or beds or simply moving potted plants indoors for the cold season. Known in Italy as limonaia, these early structures employed wood panels in storerooms or open galleries to protect from the cold. Further north in Europe, the preservation of orange trees became the trend with special-purpose buildings built to protect the tasty, but delicate fruit. Orangeries, as they came to be called were typically enclosed structures built with wood, brick or stone with tall vertical windows on the south walls. Use of these rooms expanded socially and practically, being used to entertain and to host a wider variety of plants. The term greenhouse came to describe the rooms and conservatories for tender plants. In the 18th century a Dutch scientist pioneered the use of sloping glass to bring in more light for the plants than the tall, glass side walls of orangeries. The 19th century was the golden age of conservatory building, primarily in England. English conservatories were the product of English love of gardening and new technology in glass and heating technology. Many of the magnificent public conservatories, built of iron and glass, are the result of this era. Kew Gardens in London is an example of a large greenhouse used for growing tender and rare plants, or, less often, for birds and rare animals – sometimes with the plants and animals living together. Other examples include the Great Palm House at Kew Gardens that was built in 1844, built by Decimus Burton and the Crystal Palace, built for London's Great Exhibition of 1851 by Sir Joseph Paxton. The widespread construction of UK conservatories came to a halt with the onset of World War II. 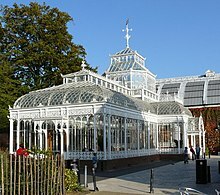 While the advent of insulated glass in the 1950s and 1960s saw the development of simple sunroom structures, it was not until the 1970s that creative architects and builders began to recreate the Victorian styling of 19th-century English conservatories in smaller domestic versions using insulated glass. In contemporary construction, a conservatory differs from an orangery in having more than 75% of its roof surface made from glass. Frame and roof materials include aluminium, PVCu and timber. A conservatory by definition must have more than 50% of its wall surface glazed. Contemporary conservatories use a number of technologies to ensure glass is as energy efficient as possible, ensuring it lets in the maximum light possible while maintaining a steady temperature throughout summer and winter. Technologies include argon-impregnated glass, easy clean coatings, heat reflective film, thermal ribbons or thermal breaks – hollow sections of glass that intercept heat. The latest glass technologies involve self-tinting glass that darkens as heat builds up during a summer's day and then lightens as the surface temperature of the glass cools later in the day. Dawn at the Muttart Conservatory in Edmonton, Alberta, Canada. The Tollcross Winter Gardens in 2008. Inside the Tollcross Winter Gardens in 2008. Anthaeum, Hove: built in 1830 with the world's largest dome, it collapsed on its opening day in 1833. ^ Wilson, David (2004). Conservatory Style. UK: Apple Press. p. 9. ISBN 1-84092-445-4. ^ "Pool Enclosures". Retrieved 29 December 2017. ^ Antram & Morrice 2008, p. 121. Antram, Nicholas; Morrice, Richard (2008). Brighton and Hove. Pevsner Architectural Guides. London: Yale University Press. ISBN 978-0-300-12661-7. Orangeries Palaces of Glass-Their History and Development. 1994. Wikimedia Commons has media related to Botanical conservatories and Greenhouses. This page was last edited on 9 April 2019, at 13:24 (UTC).